A patient of mine just brought in a box of Girl Guide of Canada cookies that her daughter is selling. I'm frankly gob-smacked that according to the nutrition facts label there are still 1.5grams of trans-fats in 3 of these teeny weeny cookies. "Girl Guides of Canada is aware of health issues surrounding particular processed foods, including cookies, and is committed to maintaining the quality of Girl Guide cookies while keeping these concerns in mind. Currently, saturated fats are the only viable alternative to trans fats in biscuit-type foods and any reformulation in the trans fat levels of Girl Guide cookies will result in a different taste and texture. GGC is currently investigating reformulation options. 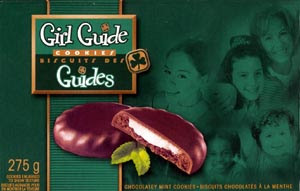 All options will be examined to ensure that Girl Guide cookies maintain the taste, texture and freshness consumers expect and enjoy, as well as a nutrition profile that adheres to new regulations." Did they really just try to sell me on a rationale that states there's simply no way to remove trans-fat from cookies without ruining their taste and texture? I guess there are no cookies at all in Denmark (where the country is wholly trans-fat free), or at least no cookies that taste good or have good texture. Makes me wonder too how Voortman's managed to remove trans fat from every single cookie product they make. Now I'm not knocking cookies. Cookies are one of life's pleasures. I'm not knocking Girl Guides, they do great work. What I'm knocking is Girl Guides clearly irresponsible laziness in not insisting that trans-fats be immediately removed from their cookies. If this ticks you off at all, feel free to write Girl Guides of Canada, but since we know from their FAQ that they already know about your concerns, I'd suggest that until they're addressed, you simply stop buying Girl Guide Cookies.